Topcon is the worldwide leading developer and manufacturer of precision positioning equipment. They offer the widest selection of innovative precision GPS, laser, optical, surveying, machine control, GIS and agricultural positioning solutions. Download the Topcon Brochure or please do get in touch with us for more information. Download the TeeJet Matrix 570 Brochure or please do get in touch with us for more information. The compact CenterLine 220 is designed to let you profit from GPS lightbar guidance with any field operation. Inside the compact guidance system is a high-quality WAAS/EGNOS GPS receiver and the guidance capabilities that make TeeJet Technologies leaders in lightbar guidance. Download the TeeJet Centerline 220 Brochure or please do get in touch with us for more information. 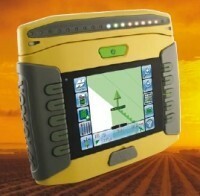 Would you like to find out more about the GPS Precision Guidance range? Call us on 01886 853 637 or fill in the contact form below and we will be in touch.